On September 3rd, 1939 after the German invasion of Poland, Britain declared war on Germany and her allies. Ten hours later, in an act of unmitigated cowardice and contrary to the Hague conventions, the London Naval Treaty of 1930 as well as the German 1936 Prize Rules (Prisenordnung), the passenger ship S.S. Athenia was torpedoed and sank, resulting in the deaths of 98 passengers and 19 crew members. According to international laws, it was forbidden to fire on unarmed passenger ships unless they were considered to be carrying contraband or military supplies. In any case, there needed to be sufficient warning so that passengers could be transferred to a place of safety. Oberleutnant Fritz-Julius Lemp, who commanded the UBoot that had been tracking the Donaldson line SS Athenia, gave the order to fire on the ship without warning. Two torpedoes hit the Athenia and she began to settle by the stern. 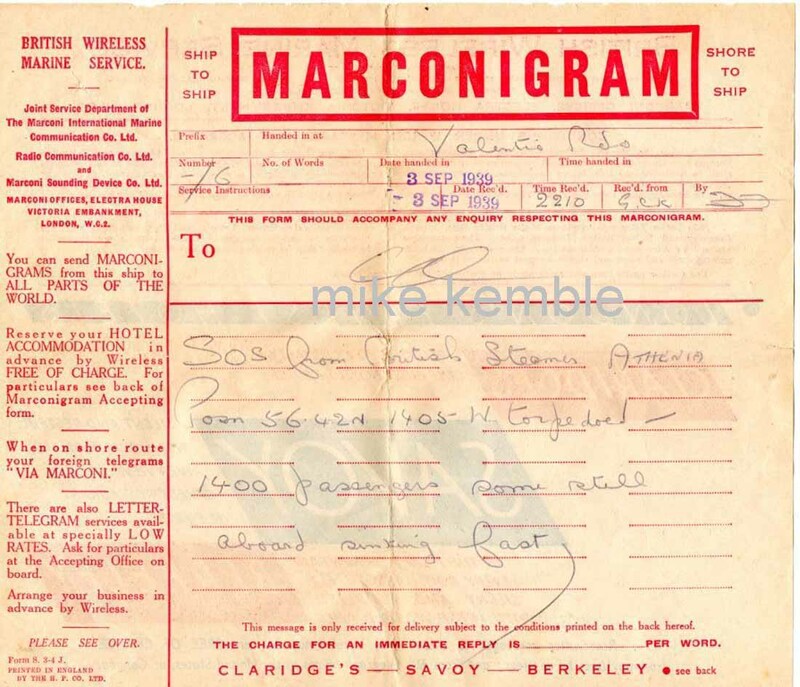 Of the 1200-odd aboard, the ship was carrying 500 Jewish refugees, 469 Canadians, 311 Americans, 72 Brits, and 315 crew. It wasn’t until twenty-one days later that Lemp reported that he had sunk The Athenia in error. Up to that point in time, Germany’s Grand Admiral Raeder had been told that no German U-boat was nearer than 75 miles to the location of the sinking. After Lemp’s admission, Raeder reported the incident to Hitler, who decided that the incident should be kept secret for political reasons: mainly because of the 28 Americans who were killed. Rumours were spread that Great Britain had sunk its own vessel in order to influence world opinion against the Nazis. A month later the Voelkischer Beobachter, the Nazi party’s official newspaper, published an article blaming the loss of the Athenia specifically on Winston Churchill, the then First Lord of Britain’s Admiralty. It wasn’t until the Nuremburg trials in 1946, during a case against Grand Admiral Raeder , that it was admitted that every attempt had been made to cover up the true details of the sinking of The Athenia including alteration of the ship’s log. The lost British members of Athenia’s crew are commemorated at the Tower Hill Memorial in London. The Canadian crew is commemorated on a memorial in Pleasant Park in Halifax, Nova Scotia. SS Athenia was built in 1923 to replace a previous Donaldson Line ship of the same name. The first SS Athenia, built in 1904, was also sunk by a German U-boat in 1917 in the unrestricted submarine warfare of the First World War. The first SS Athenia, at 7835 gross tons, was also the first Donaldson Line passenger ship, carrying 50 first and 450 third class passengers. 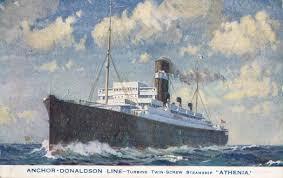 The Donaldson Line would never again name a ship, Athenia. The line continued passenger service until 1966 and finally ceased operation in 1967 with the sale of its remaining cargo ships. In total, the two Athenias brought over 1462 British Home Children: the first between 1911 and 1916 and the second between 1923 and 1932.